Max Biaggi celebrates his double race win victories at Misano with his 6 month old baby son's mouth piece in dad's mouth. It was to honor his baby's first trip to the races. Jonthan Rea was 2nd quickest in Superpole on the Honda behind Sykes on Kawasaki. 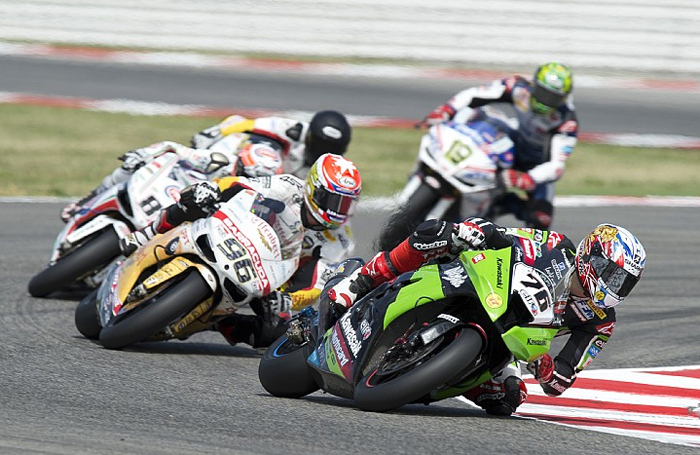 Superpole Saturday June 9th – The World Superbike riders faced a very hot Superpole today at the Misano World Circuit. Declared ‘wet’ due to the onset of rain just prior to the session, Tom Sykes (Kawasaki Racing Team) was a clear winner in Tissot-Superpole at the eni FIM Superbike World Championship round at Misano, his fifth such success in 2012 thus far. His quickest lap time of 1 minute 35.375 seconds was the best of the weekend to date, with Sykes over 0.6 seconds faster than the next best rider, Jonathan Rea (Honda World Superbike Team). Sykes now has a career total of seven Superpole wins, putting him level with famous names in SBK racing like Regis Laconi and Noriyuki Haga. Ayrton Badovini (BMW Motorrad Italia Gold Best) was a great third at his home round, while another local hero, Davide Giugliano (Althea Racing Ducati) was fourth. Jakub Smrz (Liberty Racing Team Effenbert Ducati) went fifth on the grid; Leon Haslam (BMW Motorrad Motorsport) was sixth while top Aprilia rider was Eugene Laverty (Aprilia Racing Team) in seventh. Sylvain Guintoli (Team Effenbert-Liberty Racing Ducati) crashed out when looking set for the second fastest time in Superpole two. Althea’s Davide Giugliano put on a great performance in both phases, qualifying on the front row for tomorrow’s races, in fourth position. In similarly hot conditions to yesterday, the Althea riders returned to the track this morning for the second qualifying session. Both Carlos and Davide improved by about half a second each with respect to their best times set yesterday afternoon. Giugliano made his fastest lap towards the middle of the session, using one of the tried and tested tyres. The time recorded, a 1m36.2, propelled him to the front of the pack, together with his team-mate Carlos who in turn recorded a 1m36.0 in the final stages, taking advantage of one of the new tyre solutions provided this weekend by Pirelli. Thanks to these very fast times, the two Althea Racing men concluded qualifying in second (Carlos) and third (Davide) position overall, just behind Sykes on the Kawasaki. In the final practice session which took place in the early afternoon, Carlos was the fastest rider on track, recording a best time of 1m36.1. Davide was strong in the early stages but then suffered a small crash which caused him to lose valuable time. He nevertheless closed the session in eighth position. In a ‘wet’ Superpole, the two Althea flagbearers waited for the track to dry before making a first exit in this first of two phases. Giugliano made a first exit on race rubber, before returning to the box and mounting a qualifier. With this tyre he was able to make a very fast lap which put him in third place and assured him of safe passage to phase two. Carlos was lapping fast but unfortunately a couple of minutes before the end of the session he returned to the garage as a result of a misunderstanding at the pitwall; this ‘pitstop’ meant that he unfortunately missed the chance to complete the fast lap of which he was capable, closing in sixteenth position. The continued errors for the team this season, and fourth row start for the reigning World Champion would prove to me very costly in Sunday's two races. Matteo Baiocco (Barni Racing Team Italia) was a very impressive ninth fastest in his wild card run and Loris Baz (Kawasaki Racing Team) 11th. Top names like Max Biaggi (Aprilia Racing Team), Marco Melandri (BMW Motorrad Motorsport) and Carlos Checa (Althea Racing Ducati) did not get out of Superpole one and thus Biaggi starts Sunday’s races from the third row, with Melandri and Checa on the fourth. Leon Camier (FIXI Crescent Suzuki) was 14th and top Suzuki runner in Superpole. Times: 1. Sykes (Kawasaki) 1'35.375 average 159.513 kph; 2. Rea (Honda) 1'35.991; 3. Badovini (BMW) 1'36.083; 4. Giugliano (Ducati) 1'36.147; 5. Smrz (Ducati) 1'36.183; 6. Haslam (BMW) 1'36.283; 7. Laverty (Aprilia) 1'36.365; 8. Guintoli (Ducati) 1'36.559; 9. Baiocco (Ducati) 1'37.509; 10. Biaggi (Aprilia) 1'37.686; 11. Baz (Kawasaki) 1'37.704; 12. Fabrizio (BMW) 1'37.796; 13. Melandri (BMW) 1'37.806; 14. Camier (Suzuki) 1'37.985; 15. Zanetti (Ducati) 1'38.078; 16. Checa (Ducati) 1'38.977; etc. Max (3) fights off Rea (65), Giugliano (34) and Haslam. While team mate Checa struggled to move up from his 4th row start, Althea rider Giugliano moved up to lead a couple of laps in Race One to show their reigning 2011 Superstock Champ is now ready to win in the World Superbike class. Misano Adriatico (Italy), June 10, 2012 – Max Biaggi (Aprilia Racing) left Misano with the sound of his fan club members’ voices ringing in his ears after he completed a home double that will long be remembered by all 67,000 weekend spectators. He pushed his career win total to 19 today. These were Biaggi’s second and third wins of the year, but the first since the opening race in Australia, way back in February. Having started off the third row in each race Biaggi made up places quickly and held off the close pressure from Carlos Checa (Althea Racing Ducati) in race one, then he had a clear win from Jonathan Rea (Honda World Superbike Team) and Leon Haslam (BMW Motorrad Motorsport) in race two. 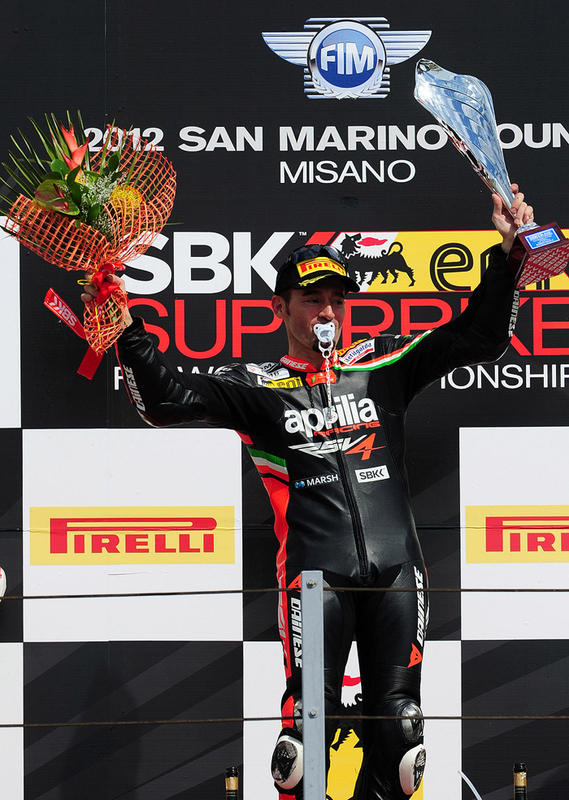 Biaggi has been the most consistent of the top riders in 2012 so far, but today he proved that when his bike is right he can also compete for race wins again. Another rider from Rome, Davide Giugliano (Althea Racing Ducati) had a podium day, third in race one, his second top three finish as a rookie in SBK racing. Off the podium positions at Misano, Chaz Davies (ParkinGO MTC Aprilia) was an excellent sixth, after starting 21st on the grid, while Kawasaki Racing Team rider Loris Baz rode with panache and pushed to score eighth in race two, just behind his team-mate Tom Sykes. Wild-card man Matteo Baiocco (Barni Racing Team Ducati) was 15th in race one but a much-improved tenth in race two. In the championship fight, Biaggi is on 210.5 points, Rea is second on 172 and Tom Sykes (Kawasaki Racing Team) has 164.5, after finishing fourth and seventh today. Biaggi rode from the third row to the win, after a superb performance in front of his home crowd. With many passes and changes throughout the race he had to ride hard at the end to defend from another lowly starter, Checa, who finished second, having started 16th. Giugliano secured a combative third place, with Sykes fourth after riding up front at the start, then dropping to seventh for a time. He overhauled long time race leader Jonathan Rea. 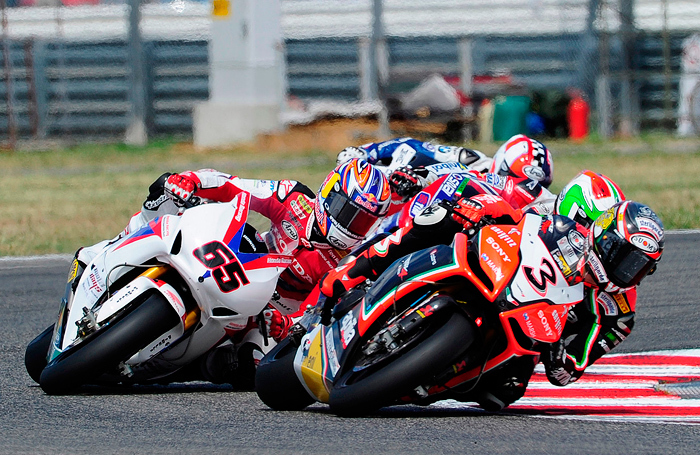 The closing laps of Race One had Giugliano still leading as Biaggi and team mate Checa prepare to pounce. Checa had caught up from his 4th row start. Superbike Race One Results: 1. Biaggi (Aprilia) 24 Laps/101.424 km in 38'58.471 average 156.139 kph; 2. Checa (Ducati) 0.305; 3. Giugliano (Ducati) 4.503; 4. Sykes (Kawasaki) 8.858; 5. Rea (Honda) 11.627; 6. Davies (Aprilia) 12.258; 7. Laverty (Aprilia) 12.551; 8. 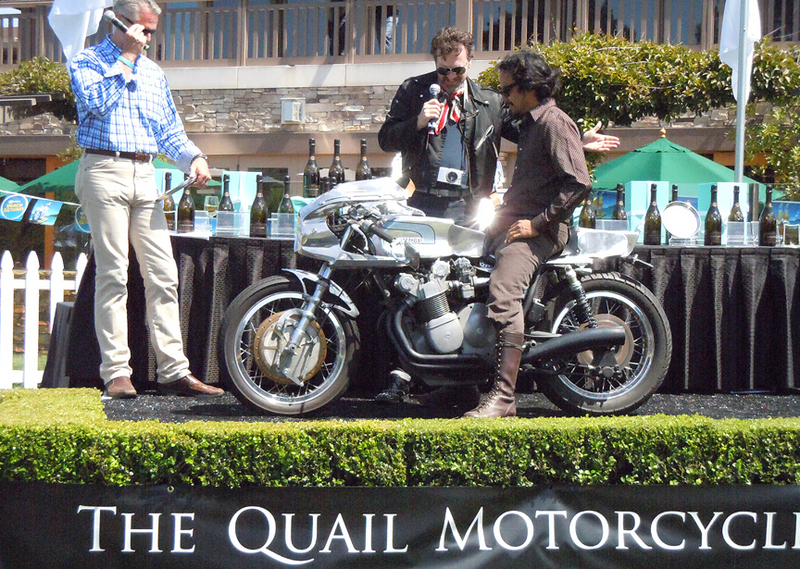 Guintoli (Ducati) 13.561; 9. Smrz (Ducati) 17.014; 10. Camier (Suzuki) 18.361; 11. Badovini (BMW) 20.029; 12. Haslam (BMW) 22.082; 13. Berger (Ducati) 22.966; 14. Fabrizio (BMW) 27.014; 15. Baiocco (Ducati) 31.133; 16. Aoyama (Honda) 31.719; etc. Kawasaki's Tom Sykes (76) dominated the opening laps of both races, but after about 10 laps the Kawasaki would overwork the tires and starting sliding and bucking, forcing the Brit to drop back to 4th and 7th place finishes. The problem with the powerful ZX-10 seems to be similar to the severe tire fade and chatter problems the powerful BMWs suffered in past years with Troy Corser..
Biaggi secured a second brilliant victory, pulling clear after some early action with other riders and winning by a margin of 5.355 seconds, easing down in the final lap. Rea and Haslam had a long fight for second with Rea securing it. Marco Melandri (BMW Motorrad Motorsport) and Ayrton Badovini (BMW Motorrad Italia Gold Bet) had another personal duel that went the way of Melandri. The top five riders were covered by only seven seconds at the flag. Race one co-stars Checa and Giugliano each crashed out of race two. Kenan Sofuoglu (Kawasaki DeltaFin Lorenzini) and Jules Cluzel (PTR Honda) contested the win in the 22-lap Supersport World Championship race at Misano but the Turkish rider had the upper hand and Cluzel had to settle for second, 1.228 seconds behind. Sofuoglu’s win makes him the only rider in this class to have won more than a single race in 2012. Alex Baldolini (Power Team by Suriano Triumph) was an impressive third, with Roberto Tamburini (Team Lorini Honda) for close company. Pole man Sam Lowes (Bogdanka PTR Honda) struggled for early pace and crashed, then restarted to finish 18th, with no points. In the championship fight, Sofuoglu now leads Cluzel, 106 points to 84, with Lowes on 76. Supersport Results: 1. Sofuoglu (Kawasaki) 22 Laps/92.972 km in 36'44.023 average 151.858 kph; 2. Cluzel (Honda) 1.228; 3. 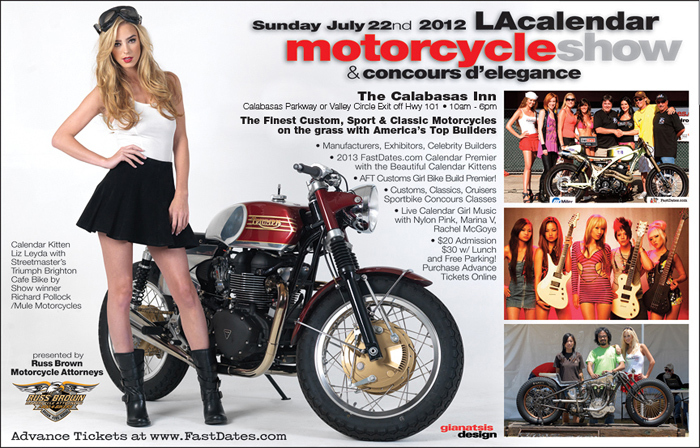 Baldolini (Triumph) 20.597; 4. Tamburini (Honda) 21.800; 5. Parkes (Honda) 26.357; 6. Morais (Kawasaki) 26.935; 7. Metcher (Yamaha) 33.183; 8. Foret (Kawasaki) 34.587; etc. Points (after 6 of 13 rounds): 1. Sofuoglu 106; 2. Cluzel 84; 3. Lowes 76; 4. Foret 63; 5. Baldolini 54; 6. Parkes 53; 7. Tamburini 38; 8. Morais 37; etc. Manufacturers: 1. Kawasaki 131; 2. Honda 131; 3. Triumph 67; 4. Yamaha 52; 5. Suzuki 6. The Superstock 1000 race was eventually run over only six laps after it had started and then been stopped after an oil spill at the third corner. Eddi La Marra took the holeshot on his Barni Racing Team Italia Ducati Panigale, but within half race distance he had been passed by Sylvain Barrier’s BMW and then Michele Magnoni’s GM Racing BMW. Lorenzo Baroni, Barrier’s BMW Motorrad Italia Gold Bet team-mate, was an eventual second after catching the leading pack on the final lap then passing two riders with ease. Magnoni was third. The top four were covered by 0.571 seconds. In the championship Barrier leads with 75 points, Lorenzo Savadori is second with 64. Superstock Results: 1. Barrier (BMW) 6 Laps/25.356 km in 10'06.206 average 150.579 kph; 2. Baroni (BMW) 0.137; 3. Magnoni (BMW) 0.528; 4. La Marra (Ducati) 0.571; 5. Savadori (Ducati) 2.269; 6. Guarnoni (Kawasaki) 2.572; 7. Staring (Kawasaki) 2.655; 8. 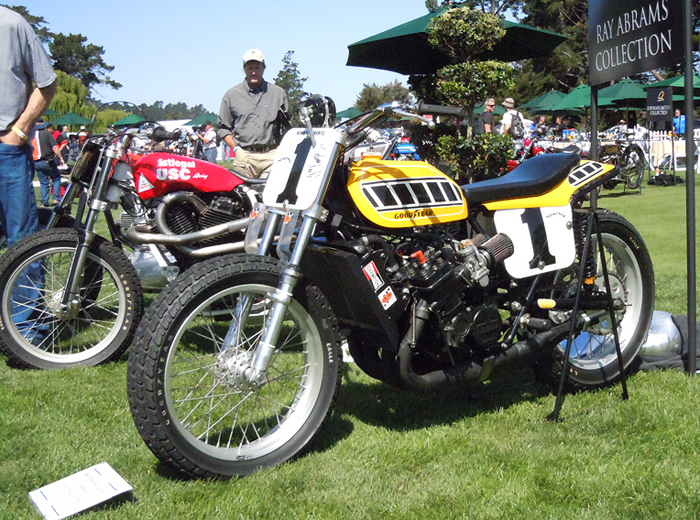 Coghlan (Ducati) 5.718; etc. Points (after 4 of 10 rounds): 1. Barrier 75; 2. Savadori 64; 3. La Marra 61; 4. Reiterberger 41; 5. Baroni 40; 6. Bergman 33; 7. Baz 30; 8. Massei 30; etc. Manufacturers: 1. BMW 84; 2. Ducati 74; 3. Kawasaki 60; 4. Honda 30; 5. Aprilia 15. The economic downturn has affect the Japanese bike manufacturers the most of all the last few years, with no major redesigns of their premier sportbikes, but if you've been paying attention to World Superbike this year, their current offerings remain highly competive, particularly in the Kawasaki and Honda camps. Honda in particular has seen little changed with their sportbikes aside from bold new graphics and some slight tweaks. 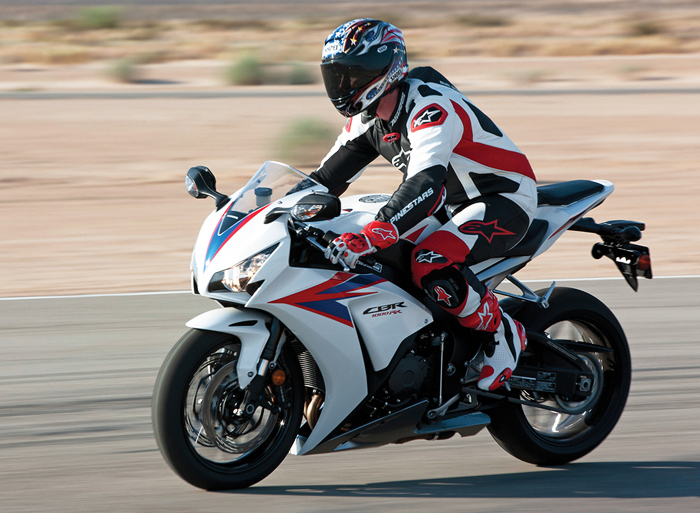 For the flagship CBR1000RR, little had changed since its inception in 2008, save for aesthetic updates and ABS. Thankfully the respected package has stood the test of time with its solid chassis and midrange monster of a motor. But four years into the production cycle, Honda fans were left wondering when the next big change would come. 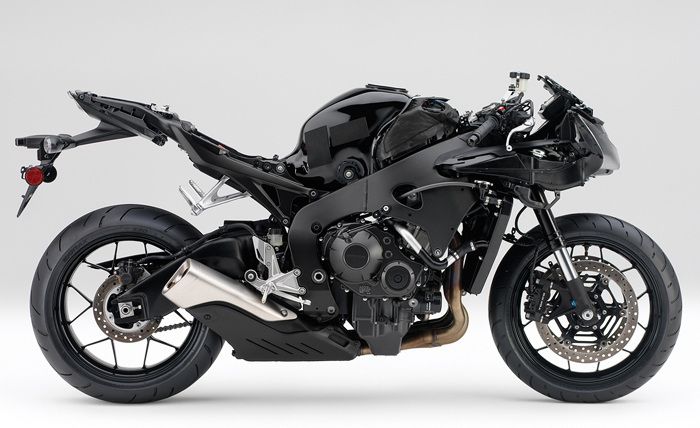 Well, the wonder will have to continue, but Honda has just released some steamy photos and information of the updated 2012 CBR1000RR. Some of the highlights include a narrower focus on balance (as if it needed more of that!) and improved handling. These tweaks come in the form of a patented Balance-Free Rear Shock, Big Piston Forks and new multi-spoke wheels. Along with new suspenders, the updated Fireblade also sports fresh bodywork that’s said to improve the aerodynamic flow and high-speed handling. 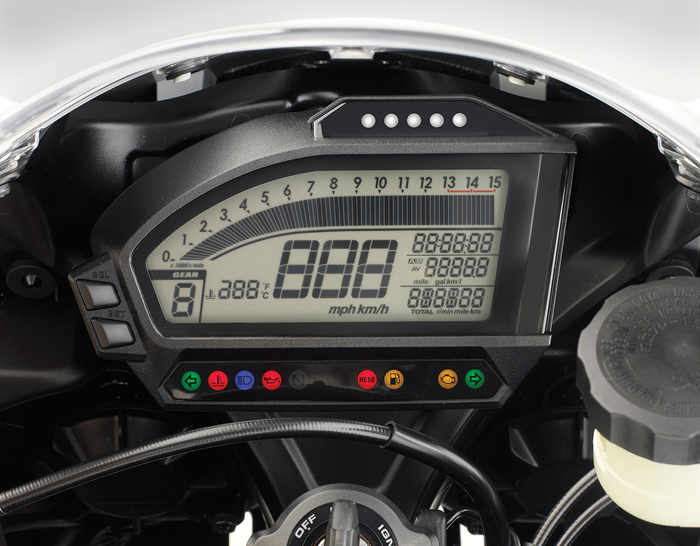 Lets also not forget the slick LCD instrument cluster that looks to be lifted straight from a MotoGP bike with features like a lap timer, five-level shift indicator and other track-ready bits. Official MSRP info now sits at $13,800 in standard trim and $14,800 for the C-ABS model. 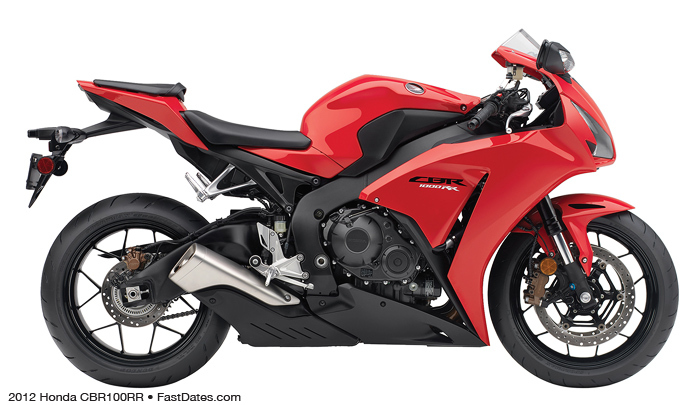 Elsewhere in the Honda sportbike line the CBR600RR gets new colors and graphics, as does the new kid on the block, the lightweight CBR250R. 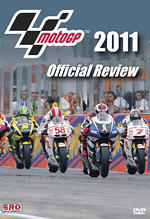 Misano Adriatico (Italy), Sunday 10th June 2012: another difficult day for the Althea Racing team today at the Misano World Circuit. The team celebrated a double podium in race 1 when Carlos Checa and Davide Giugliano crossed the line in second and third place respectively, both having put on an impressive show in front of the Italian crowds; unfortunately the success was not to continue, with both riders crashing out of the second race. Race 1 – by the end of the first lap Davide was up in third position and Carlos, having already made up ground thanks to a very fast start, lay ninth (having started from sixteenth on the grid). While Giugliano chased down Sykes and Haslam, Checa got past Melandri before heading into battle with Biaggi. On the eighth lap Carlos recorded the fastest lap of the race (1m36.0), moving gradually closer to the leading group. Towards the middle of the race, Giugliano, having passed both Sykes and Haslam, moved into second position. A couple of laps later Checa was up in fifth ahead of Melandri and Sykes. The current champion’s impressive recovery continued and at the sixteenth lap he was in third position, right behind Biaggi, second. At the same time Giugliano moved into first position, holding the lead for six laps until three laps from the end of the race, when ‘veterans’ Max and Carlos moved in front of him. The fight for victory went down to the wire; Checa crossed the line in eventual second position, just three tenths of a second behind winner Biaggi, while Giugliano finished third, earning a very well deserved second podium place of the season. 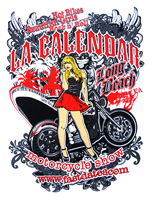 Race 2 – once again the two Althea riders made strong starts. By the end of lap one Giugliano was fourth and Checa, closing in on the leading group, in eighth position. On lap three, while in the process of making another incredible recovery, there was contact between himself and Melandri. The Italian tried to pass in a dangerous point of the track, causing Carlos to crash out as a result. Unfortunately the Spaniard was unable to continue with the race, returning immediately to the garage. Giugliano meanwhile pushed hard to catch Rea, passing him during the course of the fourth lap and moving into third position. As he pushed to catch Sykes, he unexpectedly found himself on the ground without warning. As the seventh round of the championship comes to a close, Carlos lies in fifth position in the general standings with 150.5 points, while Davide is ninth with 80 points. Ducati leads the manufacturer’s championship with 222.5 points to Aprilia’s 221. The Althea Racing team and riders Carlos Checa and Davide Giugliano will return to the Misano World Circuit in less than two weeks time for World Ducati Week, taking place between 21st and 24th June. Carlos Checa: “Considering our position on the grid, and the fact that it’s not at all easy to make passes at Misano, the result in race 1 was pretty good. I admit that I didn’t expect to be up there fighting for the win today but I was able to make up ground, which was no easy task! “Another difficult day, though we partly made up for the problem we had in qualifying in race 1. A fantastic second place finish for Carlos and above all a great performance by Davide who showed us exactly the kind of race we believed he could make, as a result of which we can consider our rider to be a force to be reckoned with, a frontrunner. WSBK June 10th - Tom Sykes (Kawasaki Racing Team) had a highpoint of fourth in race one at Misano today but kept his third position overall. Loris Baz was unlucky in race one but rode well to go eighth in race two. Sykes, who once again started raceday from pole position, took an early lead in race one, only for Jonathan Rea to pass him. Tom was in contention for the win for a few laps but as rear tyre grip issues on the warming tarmac played their part he had to drop back. He was as low as seventh on lap 13 of 24, but battled back to fourth at the flag, only eight seconds from the race winner Max Biaggi. As Biaggi doubled up his wins in race two, and as the temperatures climbed in the Adriatic coastal sun, Sykes and his team chose a tyre that was unable to handle the great increase in track temperatures and Tom had to ride hard as his rear traction dropped off, finishing seventh. The end result for Sykes and KRT is that Tom remained third in the championship, with Biaggi on moving clear of new overall second place rider Rea. On his Kawasaki Racing Team Ninja ZX-10R Loris Baz was unlucky to be forced out in race one when the electronic part of his gearshift started to fail. He had qualified well in Superpole and was able to make up ground in race two, finishing right in the wheel tracks of his team-mate Sykes, for an eighth place finish. This equalled his best finish in SBK racing so far, and put him to 19th in the championship. Kawasaki Team Pedercini competitors Leandro Mercado and David Salom found no good fortune on raceday, with Salom having a technical issue in the opener and Mercado finishing 19th. Salom fell in race two and re-injured his right shoulder, while Mercado was 16th and one place away from scoring points in the second race. In the Superstock 1000 race Jeremy Guarnoni (MRS Kawasaki) was sixth and Bryan Staring (Team Pedercini Kawasaki) seventh. New Team Pedercini Superstock rider David McFadden fell in the race and no scored, after qualifying tenth. Team BMW Motorrad Motorsport added another podium position to its tally in the FIM Superbike World Championship. 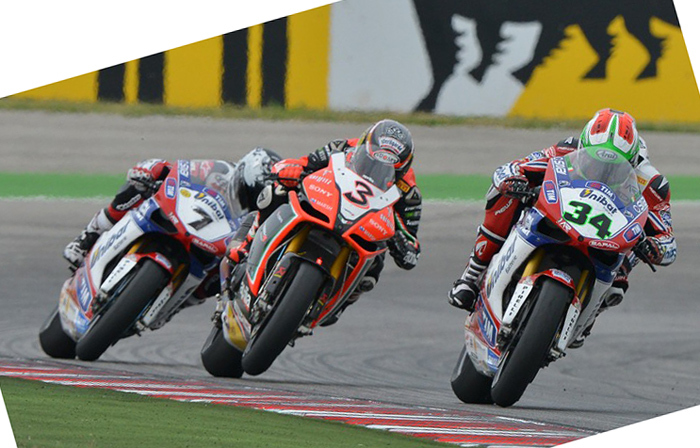 Leon Haslam’s (GBR) third and Marco Melandri’s (ITA) fourth in race two at Misano (ITA) gave a happy end to a race Sunday that started in a difficult way for the team. In race one, both factory riders were denied the top positions they were initially fighting for. In the opening stages of this first heat both riders showed an incredible performance. Starting sixth and 13th respectively, Leon and Marco quickly fought their way to the front, both being in the top five after three laps. In the process, Marco set a lap time of 1:36.100 minutes which for a while was the new lap record. Halfway through the race Leon was second and his team mate fourth, less than half a second adrift of the lead. But like several competitors, they then both suffered massive issues with tyre wear. Fighting with blunt weapons, Leon and Marco slipped back one place after another. Marco had to retire after 22 laps, having dropped back to 18th. Leon managed to hang on to 12th up to the finishing line. For race two both crews made another tyre choice – and they turned the page again. Leon was challenging for the top positions from the start. Marco meanwhile started his chase from a bit further down the field, being ninth after the first lap. From lap six on, Leon was involved in exciting battles for second place, first with Tom Sykes (GBR) and then for more than half of the race with Jonathan Rea (GBR). In the end he crossed the line in third, just a few tenths shy of second placed Rea. Marco fought his way through the field and was fourth after 14 laps. He defended that position for the remaining ten laps. With BMW Motorrad Italia GoldBet SBK Team’s riders Ayrton Badovini and Michel Fabrizio (both ITA) finishing fifth and sixth, four BMW S 1000 RRs were classified in the top six. In race one, Ayrton was 11th and Michel 14th. Both races were won by Max Biaggi (ITA). In the Riders’ Championship, Marco is fourth with 155.5 points and Leon is sixth with 123 points. In the Manufacturers’ Standings BMW lies in third with 197 points, 25.5 points adrift of leader Ducati. Team BMW Motorrad Motorsport will now head to the Spanish Motorland Aragón where it will conduct two days of testing on 19th and 20th June. 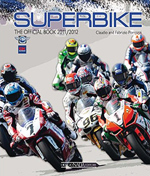 The next races in the 2012 Superbike World Championship will then take place at the same venue on 1st July. In the FIM Superstock 1000 Cup, Sylvain Barrier (FRA), Lorenzo Baroni (ITA) of the BMW Motorrad Italia GoldBet STK Team and Michele Magnoni (ITA) of G.M Racing secured a triple podium for the BMW S 1000 RR. Markus Reiterberger (GER) of Team Alpha Racing finished tenth on his RR. “It was another weekend where we challenged for the podium. In race one we were unlucky with the tyre, so we could not do anything. We were fighting for a podium position but then had a tyre issue and dropped three to four seconds a lap. The tyre was unrideable, so I was quite happy to get four points but also frustrated because after these strong first laps we did not get the podium in race one. But we did it in the second one. 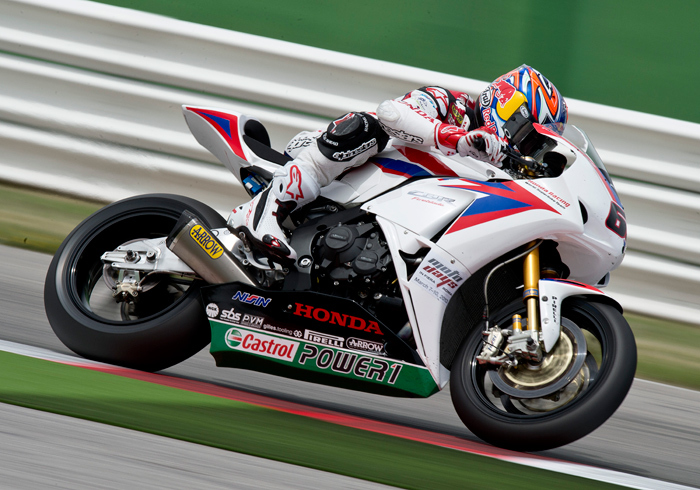 “In race 1 we used the smaller rear tyre, and the grip level was quite ok. Suddenly, after nine or ten laps, the grip level dropped down. It took only another couple of laps and the tyre was gone completely. It was impossible to continue riding, so I decided to come into the garage. In race 2 we used the bigger rear tyre. I originally preferred this tyre, but we only had one set to use before the races. When we tested the bigger tyre in practice, we had more chattering than with the small one, but did not have the opportunity to fix this issue. As a result we focused on the small tyre for race 1. In race 2 the bike felt much more consistent and the grip level was much better, but unfortunately the chattering was still really bad, so overtaking was tough. On lap four I was behind Carlos. I tried to pass him in turn four where I felt strong in braking. We were side by side, so I expected him to see me. But when we started to flick into the corner he seemed not to realise that I was next to him, as he touched my leg with his shoulder and he lost the front. 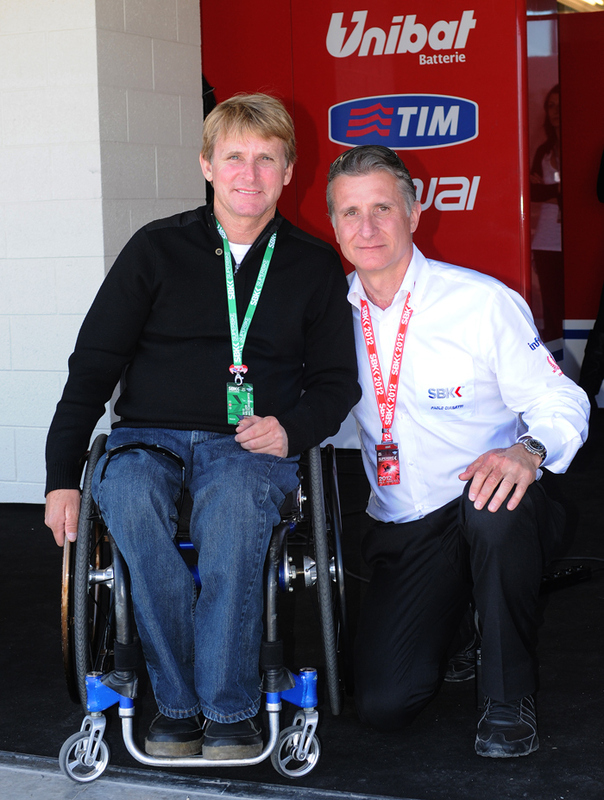 I am very sorry, Carlos is a great guy and a fair sportsman. 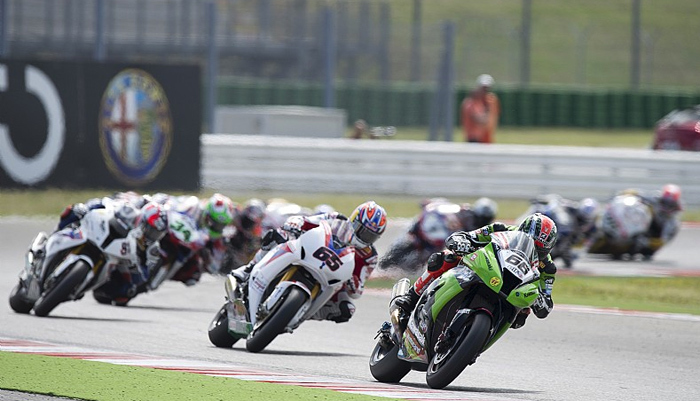 Jonathan Rea returned to the podium in the second of today’s seventh-round eni FIM World Superbike championship races at Misano in Italy, finishing second after taking fifth place in the opener. Both races were won by Italian Max Biaggi. The 4.226km Misano circuit was the venue for Rea’s debut World Superbike victory in 2009, and today’s podium – the 27th for the 25-year-old from Northern Ireland – is his third in as many rounds, moving him into second place in the championship. In significantly cooler temperatures than those he experienced during practice and qualifying, race one began well for Rea. Starting from second on the grid, he led from the opening lap until rear tyre issues dropped him from first place to fifth in just five laps. However, track temperatures increased by almost 20 degrees between races, allowing Rea’s Honda World Superbike Team to use the first choice rear tyre for race two. He was shadowed for most of the race by fellow British rider, Leon Haslam, but Rea rode a controlled race to take 20 points at the flag. His team-mate Hiroshi Aoyama finished just outside the points with 16th place in race one after experiencing similar tyre issues, but the 30-year-old Japanese rider bounced back to a points finish with 12th in race two. The first race was quite strange and I was comfortable at the front in the first part, but then the tyre went off so quickly and dramatically and it was all I could do to bring it home in fifth. I had to ride a perfect race in the second outing because from about lap nine I had ‘+0, Haslam’ on my board and that went on for the whole race. In the beginning of that race I got stuck behind Tom [Sykes] and Giuliano was being quite aggressive, so I got out of my rhythm a bit. But I stayed calm and re-grouped and made a nice pass on Tom. I made no mistakes but Leon stayed very close so he gave me a lot of pressure. I rode the best last laps that I could and it’s good to finish second here after struggling in the last couple of years. Now summer has arrived, I’m happy that our bike is working on the softer ‘A’ tyre and my guys are working calmly in the box. To get back on the podium at a circuit where we struggled so much before is good. I’m looking forward to going to Aragon now – it’s exciting, because it’s going to be a new circuit for me and I always enjoy that challenge.